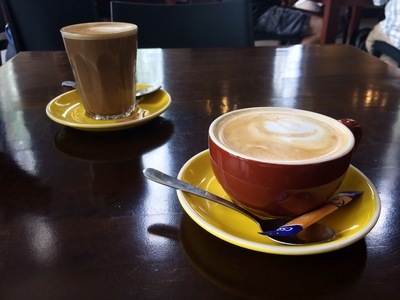 Upon café hopping in Norwest, I stumbled upon a café with an unusual name, hidden away in a street I usually don’t drive through. 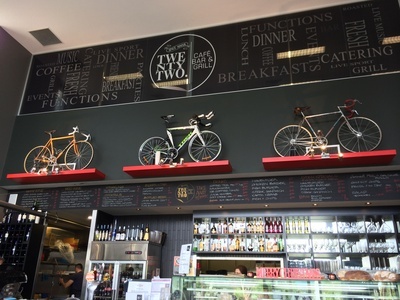 Twenty Two Café, Bar and Grill: the name itself intrigued me to go in and explore. The somewhat baffled but friendly waitress explained to me that there was no significance in the name, but the café was named Twenty Two simply because it is housed in the building that is twenty two on that street. Though the name does not have a secret agenda, yet looking around the cafe I did see a significant difference in the way the interior looks compared to similar establishments in the area. Screaming out ‘hip’ - the café, with its high ceilings, retro colours, display of bicycles, cabinets full of bottles all but created a ambience unique to its own. The wall mounted blackboard gave an endless choice of take away options, but I decided to stay and try out something from the sit down menu. While I stood near the counter ready to order, I heard the child next to me compliment on how ‘yummy’ the hot chocolate at Twenty two is. I was at a loss, tempted to try this yummy hot chocolate but craving for that morning hit of coffee. Leaving the chocolate to another day, I settled with a skinny cappuccino which turned out to be quite a yummy treat itself. Mediterranean scrambled eggs with fetta and chives on zattar bread ($16.00) I had was nothing but divine, with all the flavours in the right places. What was best about the plate I ordered was the zattar bread that came with it. The warm thin bread was folded in two. Inside it was a hidden treasure of spices and herbs. 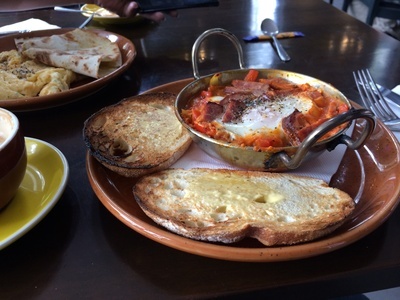 Baked eggs tagine with chorizo, capsicum, onion, roasted tomato and baby spinach served with toasted bread ($18.00) is another breakfast option I would recommend. The sizzling hot tagine comes with a thick sauce full of flavour. The tables do not have canisters of seasoning only because the plates that come out of the kitchen do not need any additional seasoning. 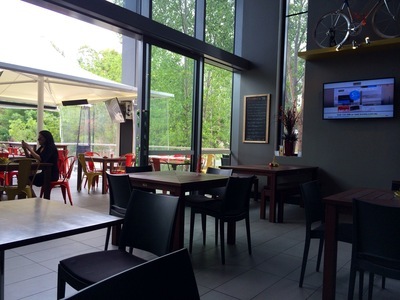 Sitting at the café gulping down tasty morsels, I couldn’t help but picture how the atmosphere would change on a sports night when herds of blokes flock to the café and sit gaping at the televisions hanging on the wall and drinking beer. Yes, the café caters for gaming nights and sports enthusiasts. Night time attractions include half price cocktails from 4pm to 6 with live music, and of course that promise of a delicious meal. Why: Trendy ambience. Friendly staff. Tasty food. When: Suitable for either breakfast, lunch and/or dinner. 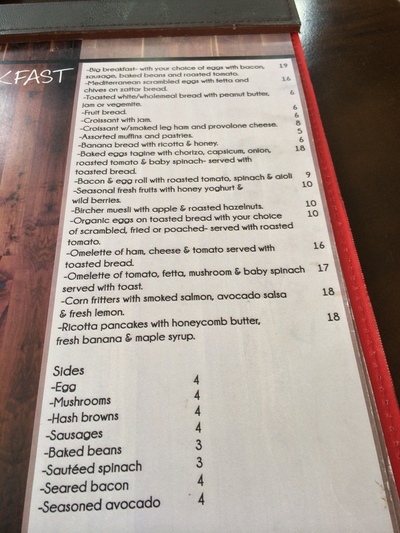 Good for kids: Kids menu available. Have you seen ATM art? Do you go for manicures and pedicures regularly? I have been to this place. Really good as mentioned in article. Spot on description. Recommended..